A Chinese student’s indiscriminate throwing of a taho (soy pudding) cup at a policeman stationed inside an MRT-3 station should serve as a “wake up call” about Chinese presence in the Philippines, Vice President Leni Robredo said Sunday (February 10). Robredo slammed the act of disrespect committed by 23-year-old Chinese national Jiale Zhang, saying it was an “insult” to the country. 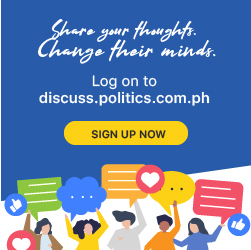 “Hindi lang pambabastos sa pulis, pero pambabastos ito sa bansa natin,” she said in her weekly radio show on RMN-DXZL 558. Robredo said the special treatment extended by Filipinos to Chinese nationals— to the point of letting them have jobs that Philippine citizens can do— might have emboldened some Chinese to be disrespectful to authorities even while they are in the Philippines. “[W]ake-up call iyon sa ating lahat. Ano ba talaga? Maraming reklamo na iyong mga trabahong dapat sana sa Pilipino, nabibigay pa sa Instik. Tapos ito pa, parang kinakalinga natin sila tapos binabastos nila tayo,” she said. Zhang threw the cup of taho she was holding at Police Officer 1 William Cristobal when he barred her from entering the MRT-3’s Boni Station Saturday (February 9). The MRT-3’s management said Zhang threw the cup of taho at Cristobal in a fit of anger as he tried to explain to her that liquid substances, including drinks, are not allowed inside MRT stations as a security measure. Zhang is currently detained at the Mandaluyong police headquarters. She is facing charges of direct assault, disobedience to agent of person in authority, and unjust vexation.